It is that time of year to start those seeds! Go ahead, and break out the one of those tacky plant stands with the big fluorescent lights, and…wait. Do we really have to have an ugly start to the growing season? I can’t stand most of the plant-growing shelves out there. Sure, I could just set plant trays on the floor, but they get trampled by dogs and slept on by cats (Yes, my crazy cat has used them as beds before). So I have to keep them off the ground, and need a good way to do that, that doesn’t look hideously ugly and take up space in my tiny house all year-round. My solution was a collapsible, minimalist, modern seed-starting shelf made from some basic materials I found around the house and the local hardware store. Everyone’s shelf will be a little bit different depending on what you have available in terms of space and materials, but I hope this article gives you some inspiration for building your own super-cool shelf. We won’t get into the details of starting seeds, but I’ll make sure that you look good while doing it. Find the best location first | You know what they say about seed real estate? Warm, warm, warm. 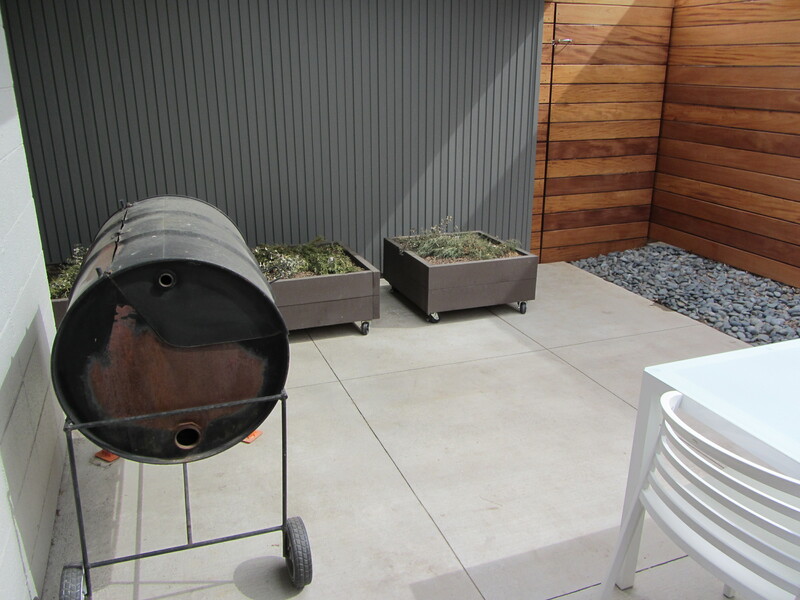 You want your seed-starting area to be somewhere that is as warm and as sunny as possible. It is also nice if it is a place that is easy for moving the seed trays out into the sun on those nice days. Other considerations include how close it is to an outlet (for plugging in seed-warming mats and potentially lights) and how much traffic the area receives (so how much are people and animals going to be bumping into it). 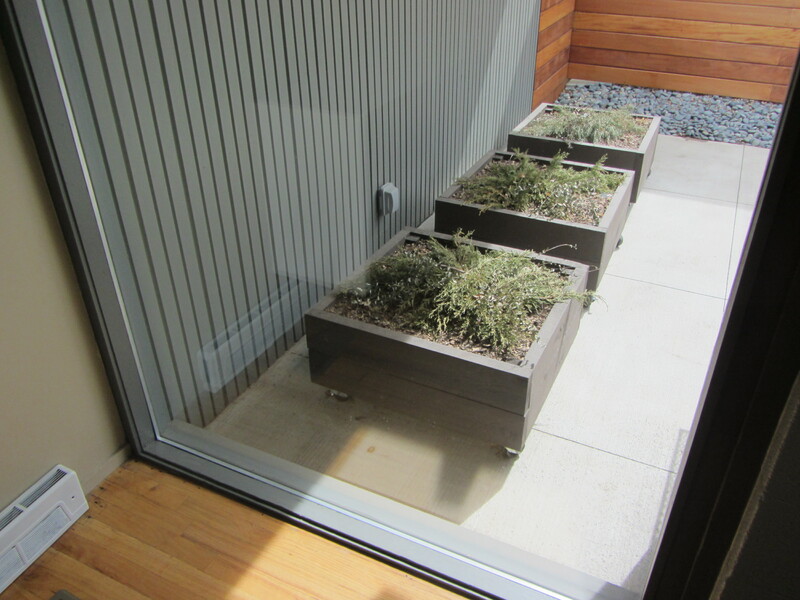 The best location for my home is on the southwest corner of the house in area right by the patio door, but still not in the main path of traffic. Design your shelf based on location | Once you decide on the area, then you can figure out the right shelf construction. Is there a way for the shelf to hang? Will it work best standing on the floor? Do some sketches (no they don’t have to look good as long as you can understand them) and realize that you’re not engineering a shelving system to hold several hundred pounds, but something that will generally hold up plant trays. For my shelf, I realized that the post-thingy between two ceiling beams would be a great tool for just hanging a set of shelves. With my tongue-and-groove ceilings, I could have also put hooks in the seams so I could remove them later without having to stare at ugly holes the rest of the year. 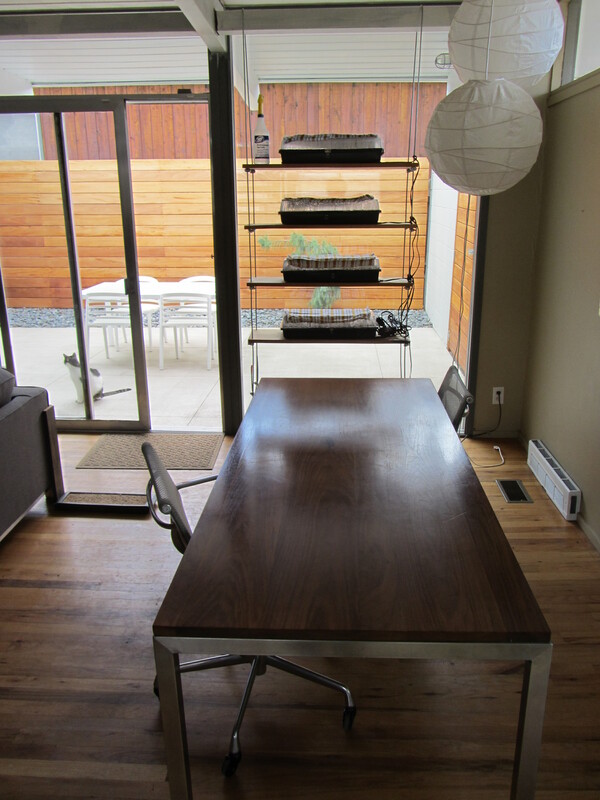 Get the shelf materials | You can get a fancy or as cheap as you like with materials. On the fancy side, you could get some mahogany or cedar, and stain them. You could also use some nice rusty metal or even acrylic for a sleek look. I salvaged my boards from some old shelves in our hallway closets. I also got some heavy gauge wire to suspend the shelf (the heavy gauge is purely for looks, my engineer husband noted that I probably needed a much lighter-weight wire) and wire rope u-clamps to secure the shelves on the wire. Think of what cool hardware you could use on your shelves. I highly recommend wandering around the hardware section at your local hardware store, and finding fun pieces to use. I’m always amazed at what hardware exists and you can use a piece for many different purposes beyond its original purpose—and you will give the hardware employees a good laugh as you try to explain to them what you’re building. I also got CMU blocks to help secure the wire rope and keep the shelves from swinging around too much, as well as some felt to put on the bottom of them to keep the blocks from scratching the wood floors. 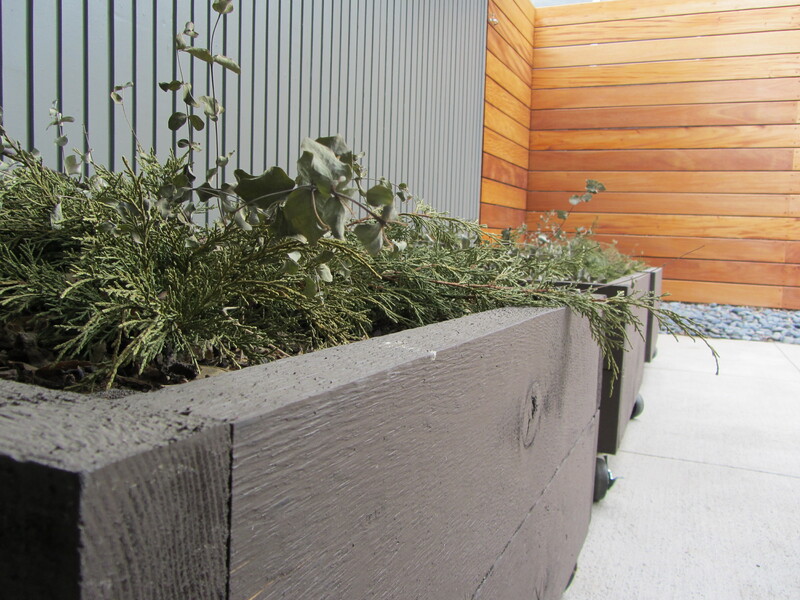 Good ahead and invest some decent planting trays and covers—think commercial-grade. Get the seed heating pads (if you have a chilly mid-century modern home like mine) as heat is critical to get most seeds going. And get some stylish or at least matching cheap towels (or use some of your formerly nice, but slightly worn out towels) to throw over your humidity domes in the early days. (Again, most seeds don’t need light as much as heat to get them started.) Home Depot-esque seeds are good, but get funky with your seeds by exploring the billions of cool seed sites out there. And last, but definitely not least, get nice soil meant for seed starting—don’t just pull out some crusty potting soil you bought a few years ago. Create! | Now, the fun starts. If you’re following the model I used, simply drill holes that are large enough to fit the wire through the shelf (Inset them an inch or so from the corners). Yes, this will likely require a drill for most normal humans. And, getting on my tool soapbox for a moment, every person, or least every household, needs to have a drill with a bunch of bits. (Trust me, you’ll never regret buying a drill.) You’ll also need the drill, with some masonry bits, to make holes through the masonry blocks. Then secure some eye-hooks in the amazing masonry holes you drilled. 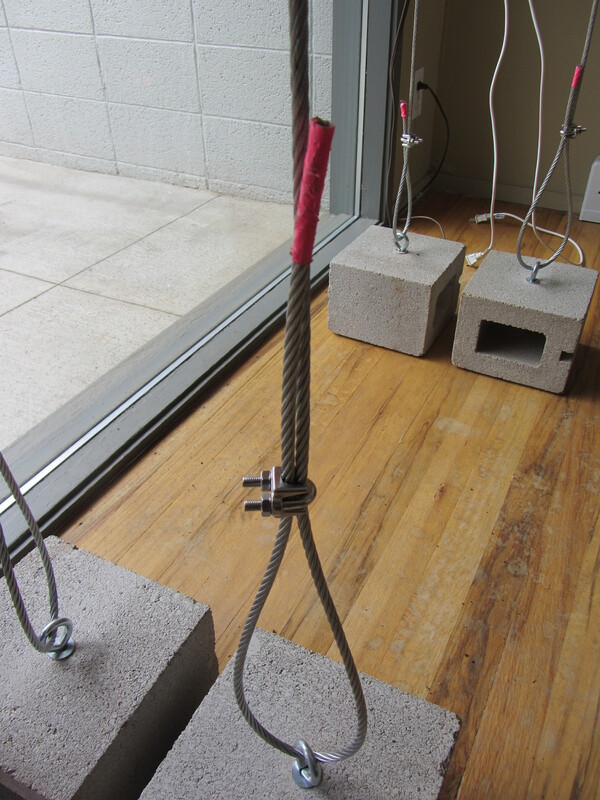 Cut the wire rope to the right length—make sure you have enough to make it through the masonry hooks plus another couple of feet—and secure the cut ends (wrapping duck tape tightly around them does the trick). 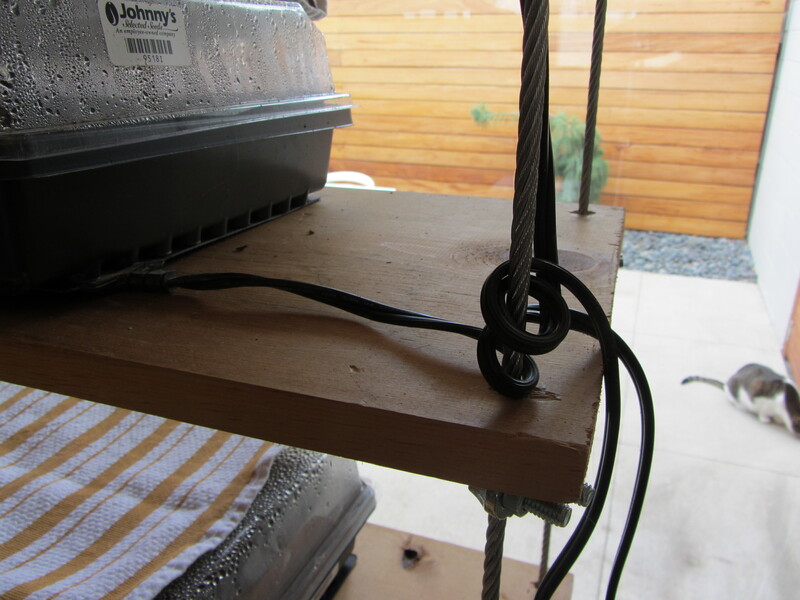 To set up the shelf, hang the wires, and start threading the wire through the shelf holes. 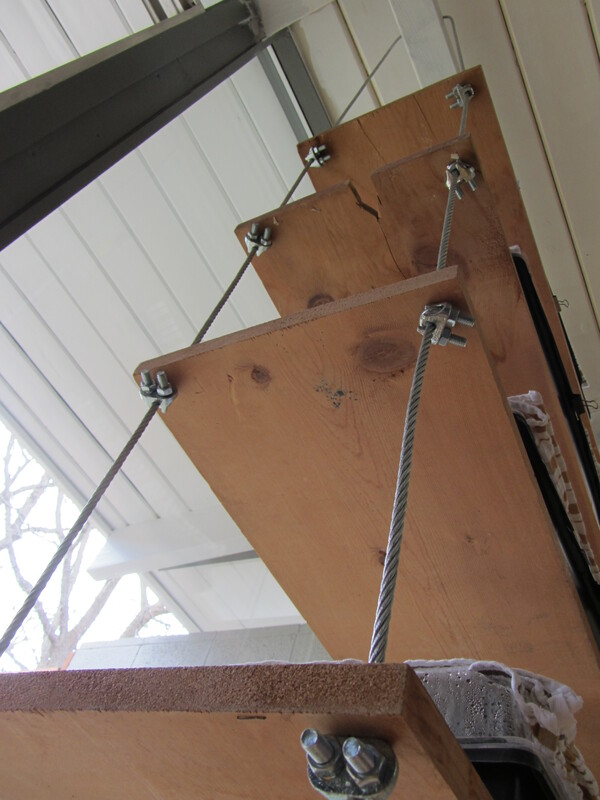 After you get each shelf threaded, thread on some wire rope u-clamps, and get the shelf to about the height you want it and tighten the clamps just until they hold up the shelf. Repeat for the remaining shelves (I space them about 12 inches apart). Once you have all the shelves up, then you can do some fine-tuning to get them level. Get a level, (another tool I know, or you can eyeball it) and check the level on all four sides, move the u-clamps up and down as needed. Repeat for the remaining shelves. 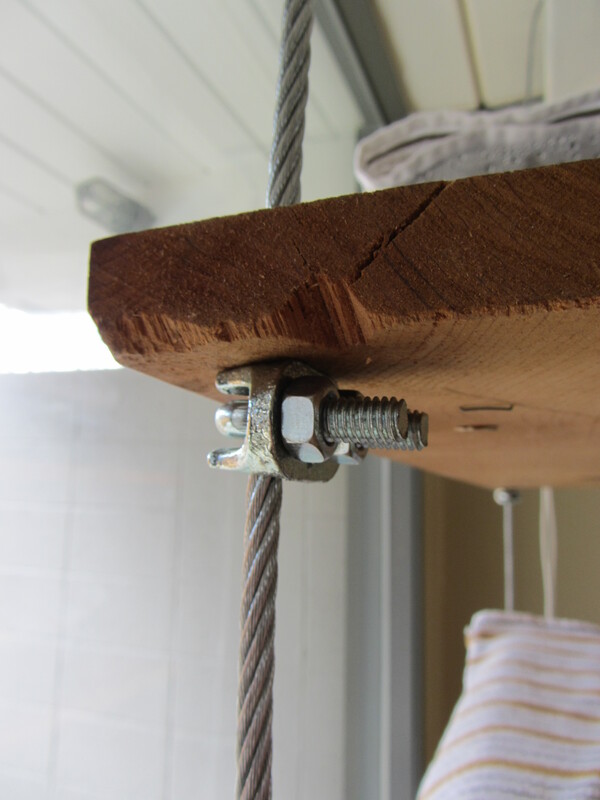 Once all of your shelves are up and leveled, loop one end of the wire rope through a u-clamp, then the masonry hook, and feed the end of the wire back through the u-clamp you just put on. Lightly tighten the u-clamp, and repeat for the remaining masonry hooks. After getting all the wires secured, loosen the u-clamps one at a time, and then start to pull the wire rope tighter and re-tighten the u-clamp to hold it in place. Keep adjusting until the shelf feels secure. Wrap heating pad cords | To keep the heating pads from getting pulled off the shelf by a stray dog tail or diabolical cat, I just loop the heating pad cord around the wire rope before letting it drape down the shelf unit. It also keeps things a little cleaner looking. Use an extension cord | Instead of having 20 cords running to the outlet, I plug all of the heating pad wires into a power strip on the bottom shelf, and just run one cord to the outlet. Use matching towels | As you first start out your seeds, you want things to be nice and warm. I cover my seed trays with towels that match my decor to help keep them warm. Just fold each one nicely and place it on top of the humidity dome. And that’s all you need to do. So simple isn’t it? 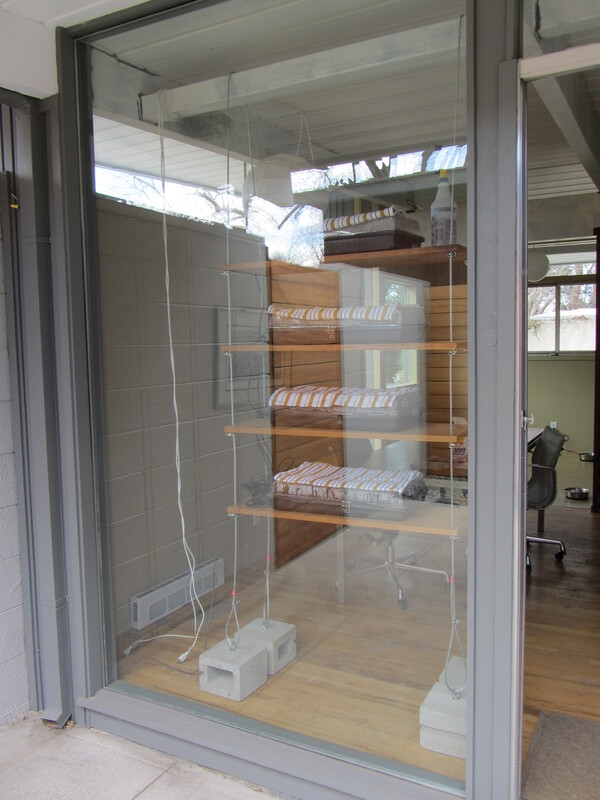 Well, once you are done starting your seeds, simply take down the shelving and stow everything away until next season. With some simple cleaning of the plant trays, you should be able to use those next year as well. And you won’t have to dread looking at an ugly plant-starting shelf ever again.